The recent death of the universally revered Nelson Mandela (Elba) makes this biography based on his memoir even more important when it opens in many theaters on Christmas Day. Its purpose is to give an overview of an extraordinary man’s life from his early years and coming-of-age rites, through his disillusionment with government when he practices as a lawyer, his early days as a sometimes violent activist, his 27-year imprisonment, and finally to his release and his stance on forgiveness and pacifism in his later years and subsequently being elected president of the Republic of South Africa. One of the characteristics of Mandela throughout his life was his value of family, even during the times when he could not be present in the family setting during his days of activism and imprisonment. Throughout his life and political activities, he never lost sight of children and their future. He and his first wife, Evelyn Mase (Pheto), became estranged after the death of their daughter and his increasing involvement in politics. Eventually, Evelyn left Mandela and took their son to live with her brother, and they divorced. During the divorce proceedings, he began seeing Winnie Madikizela (Harris), whom he married six months after the divorce was final. Winnie was active in the same movement as Mandela, and was arrested herself and jailed for a time. Throughout his imprisonment for sabotage and violence, first at Robben Island and later at Victor Verster, he and Winnie stayed married. After his release, however, because of her continued advocacy of violence and his increasing belief that nonviolence was a better approach, he decided they should separate and divorce, despite his abiding love for her. In covering Mandela’s and Winnie’s political activities across so many years, the film can only highlight some of the important events, but it does a good job in showing Mandela’s transitions among different stands at different times on the need for violence. He begins with a nonviolent stance, then feels forced after a police massacre to advocate for more aggressive resistance, and finally, especially during his imprisonment—during which time he studied a great deal—coming to his ultimate belief in the need for reconciliation among all races. He firmly believed that this could only be achieved through forgiveness. This British production directed by Justin Chadwick with a screenplay by William Nelson is concise in presenting such a long history of a rich, colorful individual. Its 2½ hour-long presentation holds interest throughout for this fascinating historical figure. 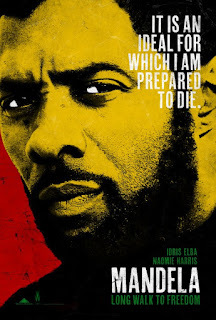 Idris Elba is marvelous in playing the title role, and even though he does not really resemble Mandela physically, his mannerisms and tone are entirely convincing. Similarly, Naomie Harris captures the fiery personality of Winnie, and when the two actors are together on screen they obviously convey the deep affection that held the two spouses together for so long during many separations. Because Mandela’s life had so many significant events, I think it would be helpful for the viewer to inform him/herself to some extent beforehand to be able to follow such a fast pace.